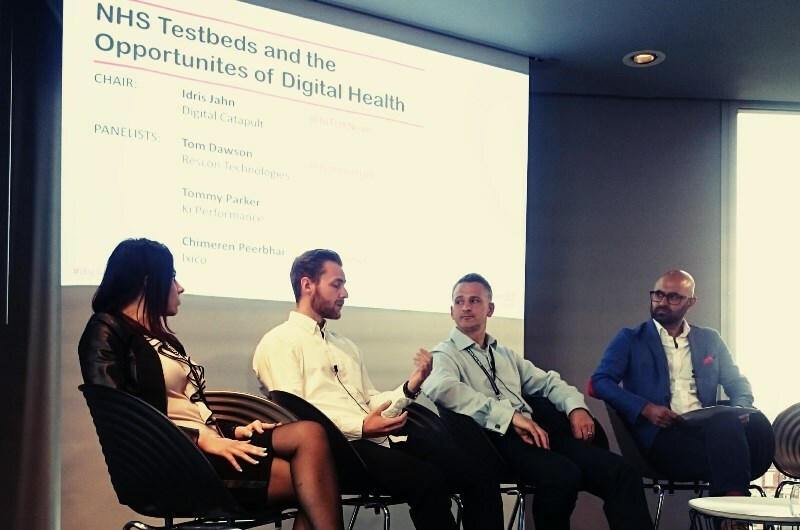 Members of our Diabetes Digital Coach team were invited to talk at the Digital Catapult’s Digital Health Festival last week in London about the opportunities for self-management being explored by our new NHS IoT (internet of things) test bed project. Tommy Parker from KI Performance and Tom Dawson from Rescon Technologies took part in a panel discussion at the Wearable Health conference, exploring the innovative ways small businesses in the UK are using wearables to tackle health challenges, as well as the opportunities this growth market presents. The discussion on ‘NHS Test Beds and the Opportunities of Digital Health’ was chaired by Idris Jahn from IoTUK, the national programme to advance IoT in the UK which is overseeing our test bed initiative. Idris, Tommy and Tom were also joined by Chimeren Peerbhai from Ixico, who are collaborating with innovation partners within three other NHS test beds to shape digital products for person-centred healthcare solutions. There was also some discussion about resistance from some groups, such as older people, with acknowledgement that there are clear generational differences in the take up of new technology, particularly health wearables. This is why we need to design solutions with users and health outcomes in mind, not simply to show what we can make technology do. If solutions are designed around needs, then it is pretty simple to demonstrate their value and show tangible benefits. A question from the floor led to an interesting conversation about the role of the health service community, particularly within the Diabetes Digital Coach test bed. Would health professionals be sceptical about becoming ‘air traffic controllers’ – simply responding to alerts and warnings from their patients’ devices? Here in the West of England, our test bed is engaging with all seven clinical commissioning groups, hospital trusts and community health services. “Diabetes Digital Coach is not just about self care. It’s also shared care. It’s about enabling conversation. “With more people successfully self-managing their condition, our test bed will allow professionals to focus on the people who are deteriorating. Those in most urgent need, can get priority of attention. Our aim is to generate intelligent data. Not just for patients but for clinicians too. Finally, the panellists were asked what their five-year hope would be for NHS on the back of the test beds. Tom Dawson spoke about how the test beds might help deliver a framework for sustainable healthcare at a lower cost through the use of technology and IoT. In particular, his hope is that this programme will improve relations between the NHS and industry, which he believes is vital in the long-term. Find out more about the Wearable Health event and the rest of the speakers here. Find out more about our Diabetes Digital Coach NHS IoT test bed here.